Tankless water heaters have become the preferred technology over conventional water heaters, but are also susceptible to accumulations of scale. Heat increases the likelihood for limescale deposits to form. As the tankless water heaters generate higher levels of heat, the scale build up becomes greater. Tankless water heaters are designed to operate at high efficiency, but hard water can work against that efficiency by forming on heating elements that can result in service calls. 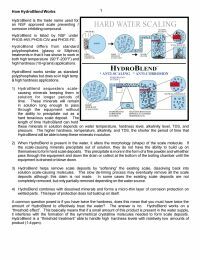 The HydroBlend SC-605-HW Scale Control Filter System is designed with simplicity and practicality in mind. There are no settings needed, no electricity required, and no guess working when the cartridges need replacement. When applied correctly, HydroBlend units will consistently feed product over the life of the the cartridge. Because of the translucent housing, a simple glance at the housing indicates when replacement is needed. Complete units include the flow-thru media delivery head, translucent housing, RSC-5-HW cartridge, stainless steel mounting bracket, and a filter wrench. Scale Prevention and Corrosion Control Providing Longer Equipment Life. Less Water Related Service Calls Lowering Maintenance Costs. Reduced Mineral Scale Deposits Lowering Operating Costs. Applications: Residential Whole House, RO Pretreatment, Convenience Store POE, Fast Food Restaurant POE. Prevention of scale build-up on heating elements, walls, and bottoms of water heaters is a must. According to the US Bureau of Standards, 1/4" of scale build-up on heating elements requires 55% more energy to attain the same temperature. This translates into real dollars wasted with an inefficient water heater, not to mention the added expense of repairing and replacing overworked water heaters due to scale build-up. This is especially true with tankless water heaters where mineral scale further reduces efficiencies. HydroBlend will not only prevent scale build-up, but also remove existing scale. NOTE: For well water applications, please contact our technical support staff. The chemical additives contained in Phos-HW, Phos-CW are Certified to ANSI/NSF Standard 60 at a max. use level of 10 mg/L.